In March 2018 the New York Times ran a much-discussed article called “The Man Who Knew Too Little” about Erik Hagerman, an Ohio man who decided to avoid learning anything that happened in American culture after the November 8, 2016 election. [*] To this day he knows nothing about the current state of American politics. His philosophy and its potentially extreme consequences came to mind when I read Kristin Hannah’s recent release The Great Alone, a novel about a vet with PTSD, Ernt Albright, who inherits a remote piece of Alaskan property from a fallen Vietnam comrade in 1974 and moves his family there to escape the world he knows. What would it be like to remove yourself completely from the blare and hustle of popular culture? To avoid the toxic bombardment of negative news and social media? Also, how does anyone in the so-called developed world find a better way to live without technological progress, creature comforts, and other modern amenities? The impressionable thirteen-year-old Leni Albright, her emotionally fragile mother, Cora, and former POW father, Ernt, seek such an existence, abandoning anxious, peripatetic lives in California to pioneer in unspoiled Alaska. Leni must adapt both to fresh territory and a new modus operandi, where she attends a one-room school and joins her parents in a life off the grid. As they fix up their ramshackle house during the scant months of summer, Leni and her parents learn to survive with the help of independent and eccentric neighbors who teach them to hunt for meat, grow and can vegetables, fix up their new home, and survive a long winter without a television or a telephone to call their own. Yet the fissures in their family widen over years when her controlling, troubled father succumbs to the pressures of a northern winter’s constant snow and daily eighteen hours of darkness. As the family works their farm amidst the threats and splendors of the encroaching wilderness, Ernt suffers less from external dangers than his increasing paranoia. Attempting to form a militia, he keeps imaginary foes at bay by building his home into a fortress to protect him and his family when the “—- hits the fan,” as he repeats incessantly. 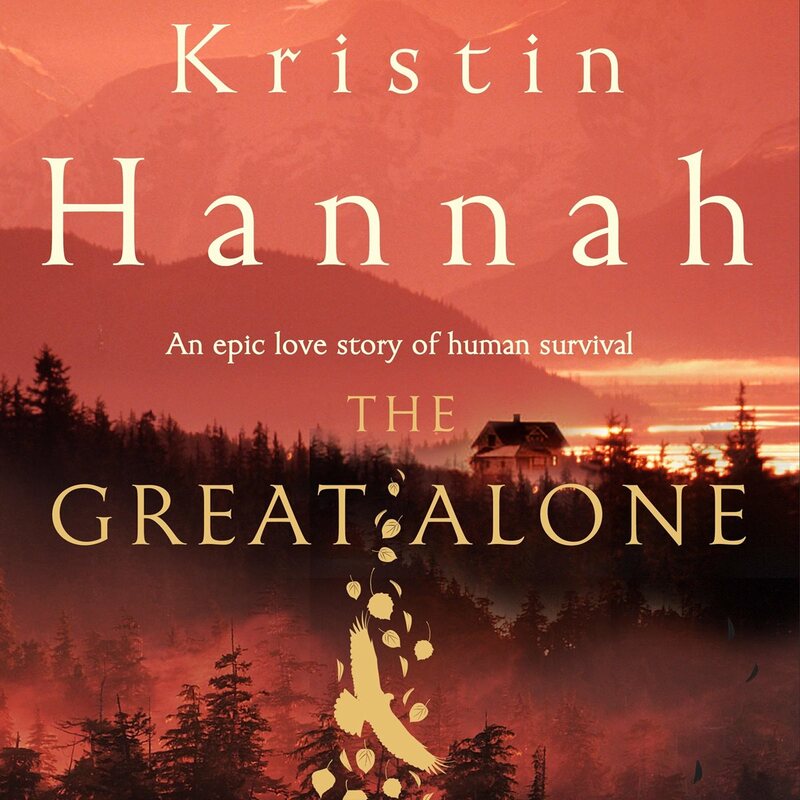 Kristin Hannah’s multi-faceted work focuses in large part on a young girl’s development into a woman in a great alone: a place where the alienation and dysfunction that exists within her family threatens her as much as struggling for sustenance and protecting herself amidst her isolated, harsh surroundings. Leni confronts both her parents and her own nature as she becomes the thoughtful, strong person she is meant to be: a true Alaskan “red in tooth and claw,” surrounded by the neighbors and the beautiful, treacherous wilderness she grows to love. While the plot can become somewhat melodramatic and contrived, Hannah creates an absorbing work of popular fiction, putting her finger directly on contemporary yearnings for a more profound life. Having grown up there, she explores the soul of Alaska and its occupants in an easy-to-read and thoughtful way. Casting Leni’s family as its own final frontier, The Great Alone leaves them to face the ultimate enemy, themselves, without illusions. They will either succumb or find a way to thrive despite all danger and difficulty.